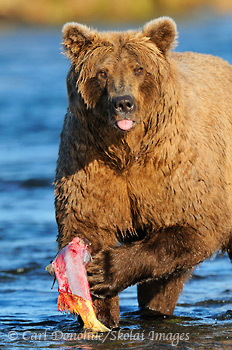 Brown bear eating a Sockeye Salmon. Brown bears love to eat the fat rich skin first, consuming much needed calories for their own winter hibernation. The brown bear here has it's tongue poking out. Brown bear, Ursus arctos, Katmai National Park and Preserve, Alaska. Please click on the image above to view a larger version of this photo. Just back from 2 weeks shooting brown bears here in Alaska, and I hardly have time to unpack before I’m heading out on my next trip, but I wanted to post at lease something from the bear photo tour before leaving. This year I wanted to concentrate on some different kinds of images than I normally shoot, so I shot a lot less, and threw out even more than usual; but I did come away with some photos, I think, that I’ll be happy with. I still haven’t looked over all of them yet, but I know I made at least a couple I will like. Once I get down to editing I’ll try to post a few. This bear had been walking up the river and was pretty successful catching salmon. We had some nice light on this particular afternoon, so I tried to position our group where we’d have a nice low angle and the light in our favor; being ready for the ‘decisive moment’ means thinking ahead and being proactive in your shooting; something I try to reinforce on our photo tours. You’ll notice the salmon here has been almost “skinned”; brown bears love to eat the calory-rich, fatty skin first, rather than the protein-filled meat we so love to grill. Brown bears need the calories and fat for their long winter hibernation (as long as 6 months), so packing on the pounds is the name of their game. They’ll often rip the skin clean off the fish, then eat the roe (eggs), and then discard the carcass in search of more of the same. This entry was posted in Adventures, Alaska, Katmai National Park, Photo Tours and tagged Brooks River, Brown bears, Grizzly Bears, Katmai National Park, salmon on October 5, 2011 by Carl D.
Great light and pose Carl!